If you don’t protect your lawn, then you could be overrun by lawn pests such as weeds and insects. Now that there is plenty of fresh air, sunshine, and yes, rain, your lawn is flourishing. But at the same time, you’ll have to protect it. If you don’t, then you could be overrun by lawn pests such as weeds and insects. Here are some tips for minimizing the presence of these interlopers and getting rid of them. Use Mulch: Mulch is a great way to jump start your lawn in both the spring and summer. Weeds are tenacious lawn pests that will do their best to turn your lawn into their personal playground. 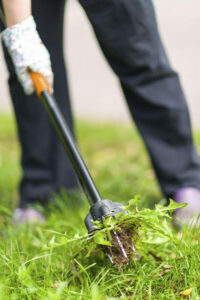 Mulching your lawn can suffocate the weeds by cutting off their supply of air and sunlight. With the right mulch, you won’t need to spend time watering your lawn as much, either. Just Add Water: That said, water might do the trick. Set up an irrigation system by where most of your plants are located. By doing this, you can specifically target your plants to keep them healthy while dehydrating the weeds and slowing down their growth enough to easily cut them down. Cut Them Down: Once the weeds are weak enough, you can cut them down. Just pulling them up won’t be enough – you have to attack the weeds at their roots. Pay Attention: Insects are going to be just as plentiful and annoying as the weeds are. So, to prevent the infestation from taking hold, spend some time taking care of your lawn and landscape. Any time you see leaves strewn about, do your best to collect them. Also, look at your landscaping features such as your trees, flowers, and shrubs – are they growing wild and out of control? It may be time to trim them back. Clear Away Water: Standing water is your enemy. Not only is it a convenient breeding ground for germs and mosquitoes, it means that your lawn retains more moisture. Lawn pests of all kinds will be drawn to sources of water. Don’t let your home’s lawn become a watering hole for beetles, wasps, termites, or any other insect. Be careful how much water you use when you irrigate your lawn, and make sure you clean up any puddles you see as soon as you can. This entry was posted on Friday, June 8th, 2018	at 4:41 pm	and is filed under Lawn Tips	. You can follow any responses to this entry through the RSS 2.0	feed. Both comments and pings are currently closed.